I fell for the title, wondering how a writer would bring these subjects together. When I received the book I saw the rest of the title: “The Kingship of Edward IV” suggesting that this is a historical book. Indeed it is. Actually the book is very interesting, but my mind has the habit of filtering out historical details and in a book such as this, it is already filtering while I read! Indeed, I am not good with reading detailed historical accounts and that is exactly what Hughes presents in this book. 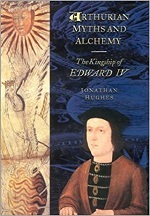 As the title suggests, the book is about Edward IV (1442-1483). In the lengthy introduction the author sketches what came before (and a little after) him. Edward IV came to the throne at an early age. He was a very tall and handsome man and very social too. He could make anybody like him. That and some early heroics made him a relatively popular king. That is, until he realised that his youth started to escape him and he fell into a less kingly way of living. Edward IV was not the first king who had alchemists at his court. These alchemists were not trying to make gold for the king, but they looked after his well-being, both physical and mental. What Edward also understood well, was that having an impressive lineage would heighten his esteem. For that reason there were also authors in his court building his mythological past and tracing it back to Troy, Greek heroes, but also King Arthur. In this way the court of Edward IV included famous men like Georges Ripley (1415-1490) (of the famous alchemical Ripley Scrolls) and Thomas Malory (1415-1471) (of Le Morte d’Arthur). That is not something I heard before! What may be even more interesting is that these subjects indeed do come together. Where the Ripley Scrolls (there are different versions) are mostly alchemical, there are similar scrolls with (mythological) genealogies that also contain alchemical symbolism. What is also new to me, is the author’s way of explaining such alchemical drawings which he gives political meanings. And so Hughes sketches a (to me) new approach to alchemy which is not just the changing of metals or a spiritual practice, but a method that was used in a wider manner in these days. Very interesting indeed, but the overwhelming amount of historical details gave me problems with attentively reading the book… If you have less problems with history lessens, you might be interested in this one.